François Robichon de la Guérinière decried the lack of ability seen in the majority of those who called themselves horsemen during his time. He stated that many considered horsemanship the only art that simply required practice — not principles. He proclaimed that practice without principles only results in a forced and uncertain performance along with a false brilliance. La Guérinière has been called both the “Father of French Equitation” and the “Father of Modern Dressage”. His book, École de Cavalerie was first published in 1731 and later under different titles in 1733 and 1802. The original work consisted of three parts, the second part dealing with training. The School of Horsemanship Part II, published by Xenophon Press, is an English translation of Chapters I through XVIII of the second part of École de Cavalerie. These chapters were considered the most pertinent for modern readers. Illustrations are reproduced from the 1733 edition. La Guérinière states that most of the earlier masters of horsemanship failed to provide a written record of their knowledge. He further felt that most of the books that had been written were either too abbreviated to be useful or too filled with boring dissertation and improper scholarship. In contrast, la Guérinière hoped to develop his ideas in a precise manner and add clarity through diagrams. In contrast to those during his time who thought school work was a waste of time for the ordinary working horse, la Guérinière insisted that the purpose of the school was to supple the horses, make them gentle and obedient, and place their weight on their haunches, therefore making any horse more pleasing in his movements and more comfortable to ride. He also called for an understanding of the individual horse. One often demands things that the horses are not capable of doing in a desire to push them too fast and teach them too much. These excessive demands make them hate exercise, strains and tires their sinews and tendons, upon whose elasticity suppleness depends, and often these horses end up ruined when it is believed that they have been trained. Thus, no longer having the strength to fight back, they obey, but without grace or any spirit. 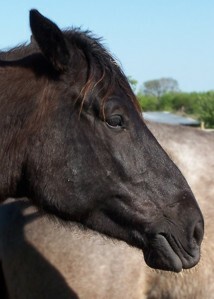 There is still another reason that contributes to the formation of these faults: the horses are ridden at too early an age, and because the work demanded of them exceeds their strength and they are not developed enough to resist the degree of control they are subjected to before being trained, their loins are strained, their hocks are weakened, and they are permanently damage. The proper age for training a horse is six, seven, or eight according to his native environment. La Guérinière felt that the proper age for training a horse was six, seven, or eight, “according to his native environment”. At the same time, he regretted that an earlier habit of working with younger horses was no longer practiced. He states: “There used to be persons in charge of exercising the foals outside the breeding barn when they were still wild.” He goes on to describe how this was done. These people would accustom the young horses to allow someone to approach them in the stable, to pick up all four feet, to touch them, and to put on the bridle, saddle, crupper, girth, etc. They gave them assurance and made them gentle when mounted. They were never harsh or forceful, because at these times they would only use the most gentle methods that came to mind. Through this ingenious patience, they made a horse familiar with and a friend of man, maintained his vigor and courage, and made him understand and obey the first rules. La Guérinière called first for use of discrete cues. If the horse did not respond, however, he called for more aggressive action. An example is his description of the use of the spurs. The discreet and gentle pinch of the spur is an aid performed by subtly drawing the spur close to the belly hair without contacting or penetrating to the hide. It is a stronger aid than the thighs or calves. If a horse will not respond to any of these aids, then a brisk spurring should be used to punish his indocility. The spurs are an excellent remedy to make a horse keen and sensitive to the aids, but this form of punishment should only be administered by a wise and experienced horseman. It may be necessary to use them with force on occasion, but this should be done only rarely. For nothing is more likely to break a horse's spirit and drive it to desperation more quickly than spurs that are used too often and at the wrong times. 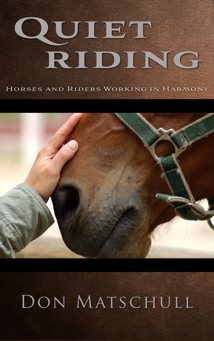 He also emphasizes the importance of considering the individuality of a specific horse. It is very important that the degree of punishment should fit the temperament of each individual horse. Quite often the mildest chastisement administered justly and at the right time is sufficient to make a horse attentive and obedient. This method of using the mildest punishment required has the advantage of conserving both the good disposition and courage of a horse. A great deal of finesse and diligence are required because the correction must be administered at the very instant that a fault is committed. If the punishments are not used at just the right moment, they will prove to be more dangerous than useful. Readers of this book will also be interested to discover how definitions of equitation movements often change over the years. An example is la Guérinière's description of the volte. La Guérinière states that the ordinary volte was to be done with the haunches moving in a small square and the front of the horse making a larger square with rounded corners. In contrast, the reverse volte was performed by the front of the horse describing a small square and the haunches moving in a large square with rounded corners. The volte was performed as a shoulder–in with the inside legs passing over the outside legs. In the volte–in–reverse, the outside legs passed over the inside legs as in the croup to the wall. As for the size of a volte, it must be adjusted to a horse's height and length because a small horse on a large square or a large horse on a small square would not be graceful. Horsemen have found an accurate size by using the space of two horses' lengths from one track to another of the hind feet, so that the diameter of a regular volte must be made up of four horses' lengths. The School of Horsemanship Part II is an important work, not only as a historic record of how equitation was practiced centuries ago but also, because of La Guérinière's empahsis on understanding and working with the nature of the horse. it is necessary to consider the horse's temperament, because the best lessons, which are only invented in order to perfect this temperament, would produce an opposite effect if one were to be abusive by exercising them inappropriately.